Place a metal rack or trivet in a slow cooker. Grease and flour a 5 to 6 cup mold or 1-1/2 quart casserole dish. In a large bowl, beat butter with sugar at medium speed until creamy. Add egg and mix until blended. Add pumpkin and buttermilk and blend on medium speed. Mix flour, baking soda, cinnamon, nutmeg and salt together and add to creamed mixture. Spoon into prepared mold. Cover with foil that has been greased on one side. Place greased side down. Pour 2 cups hot water into crockpot . Place covered mold on rack in crockpot. Cover and cook on HIGH 3-1/2 TO 4 hours. Turn out on cooling rack. Serve warm or cool topped with whipped topping and nuts. 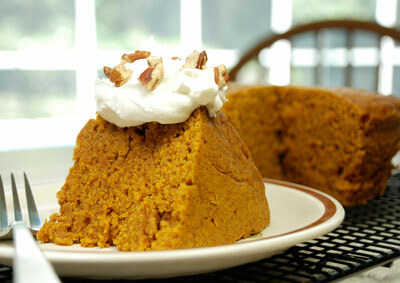 You can prepare steamed bread or pudding in a shaped mold or jars in the crockpot. Do NOT use shortening cans, coffee cans or vegetable cans for cooking in the crockpot. Most cans contain lead and are painted with or sealed with materials that give off toxic gases when heated. If you use jars, use only CANNING jars. They are tempered and will withstand the heat. Choose straight-sided canning jars with WIDE mouths making it easier to remove prepared food from the jars. To ensure that the baked cake or bread will slip out easily, grease the inside of the jar or mold and line the bottom of the jar with waxed paper. Cover each jar with a piece of foil greased on one side. Place the greased side DOWN and press the foil around the edges of the jar to seal tightly.